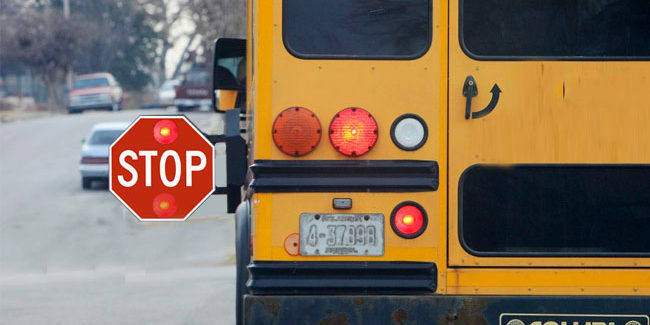 All states have a law making it illegal to pass a school bus with its red lights flashing and stop-arm extended. Yet, some drivers choose to ignore the law or simply don’t understand the law. 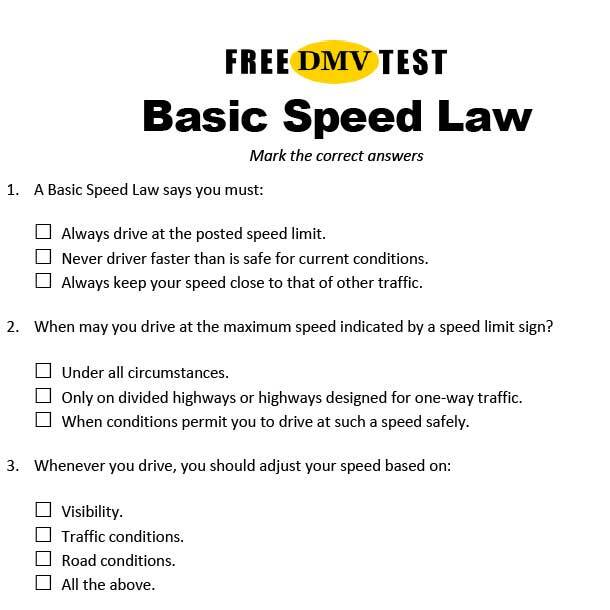 You are likely to find chapters in your driver’s manual that describe when you need to stop and what types of highways are covered by the law (all roads or only non-divided highways). Often, you will also see what penalties are for breaking the law. Some States have set high fines, as well as a high number of points, or even the potential for license suspension. This is an indication of how seriously they view this violation. What Do the Amber Lights Mean? Flashing amber lights are used as a warning to drivers that the bus is preparing to stop. Amber (or yellow) lights are used as a warning to drivers that the bus is about to stop. They are like yellow lights at an intersection, you must slow down and prepare to stop if you can do so safely. 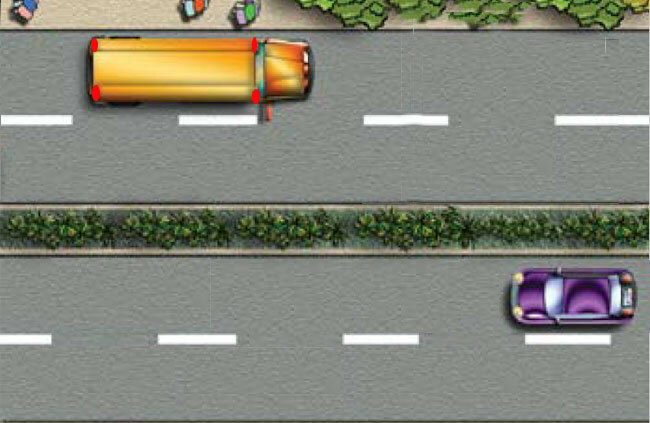 When Can You Overtake a School Bus? Question 3: When are you allowed to overtake a school bus? C. When red lights are flashing. You may pass school buses when they are in motion and no lights are flashing. 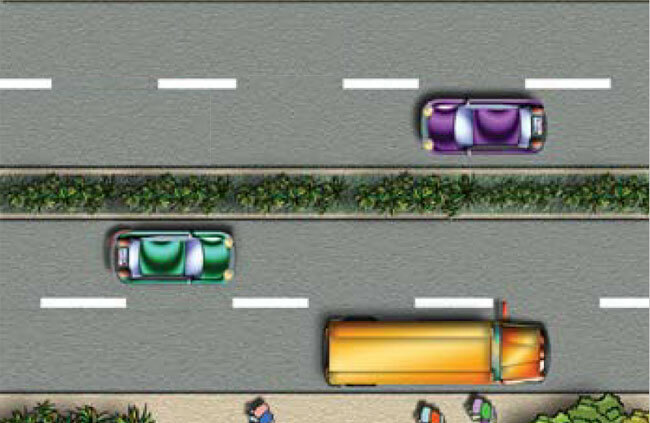 Question 4: When are you allowed to overtake a STOPPED school bus? Remember, a school bus driver signals you to stop by turning on flashing red lights and extend the stop arm. When no lights are flashing and stop arm is withdrawn, you may proceed with care. If a school bus on your side of the road has its lights flashing and a stop sign extended, you must stop. This is the law in all 50 states and District of Columbia. C. Must remain stopped as long as the school bus has the red lights turned on. A school bus may stop near a traffic light. When the light turns green, it is easy to focus on the traffic light and pass the stopped bus despite the red flashing lights and an extended stop arm. 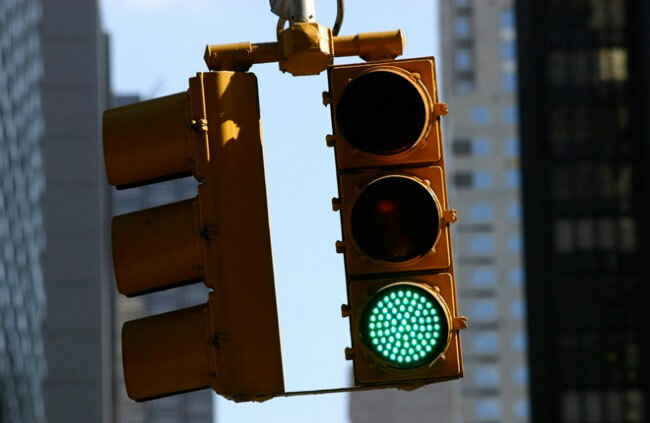 Remember that you must always remain stopped while lights are flashing and a stop sign is extended. On undivided highways with two lanes, traffic in both directions must stop when the school bus driver activates flashing red lights and extends the stop arm to indicate the school bus has stopped and students are getting on or off the bus. While wording varies, this is the law in all states. 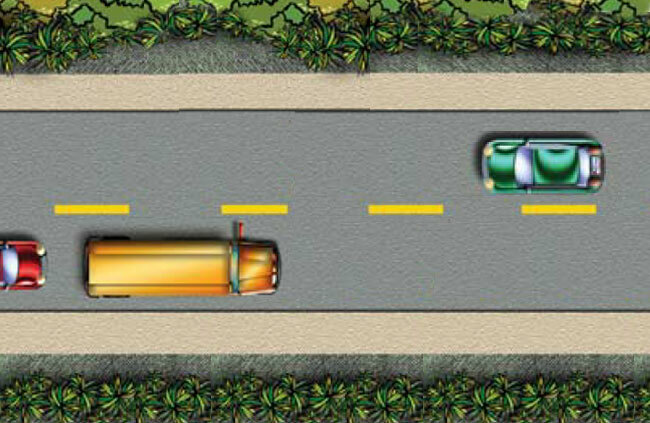 In general, you must stop when meeting a school bus from the other direction on all undivided highways. Painted lines or pavement markings indicating a turn lane are not considered to be barriers. You are still on an undivided highway. The exception is Washington State. 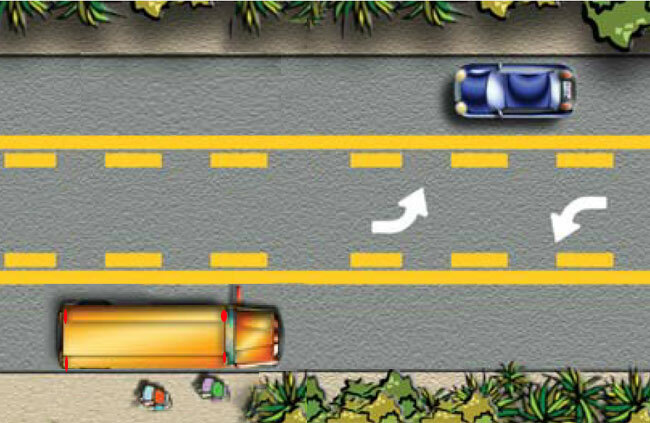 In WA, correct answer is A, you don’t need to stop if the roadway has three or more marked traffic lanes (including turn lanes). In New York State, traffic from either direction must stop. This law applies on all roadways in New York State. You must stop for a school bus even if it is on the opposite side of a divided highway. In West Virginia, you must stop even if you are on the opposite side of a divided highway – unless it’s a controlled-access highway (interstate highway). Arkansas make an exception for narrow dividers, less than 20 feet (6 m) in width. CORRECT ANSWER GENERALLY: B. Again: In general, you must stop when meeting a school bus from the other direction on all undivided highways. Some states make exceptions for multi-lane highways. Those stats include: Washington state (3 or more lanes), California (2 or more lanes of travel in each direction), Ohio (4 or more lanes), Idaho (4 or more lanes), and Kentucky (4 or more lanes). Rules by state – compiled from driver’s manuals for each state: Stopping for School Buses. 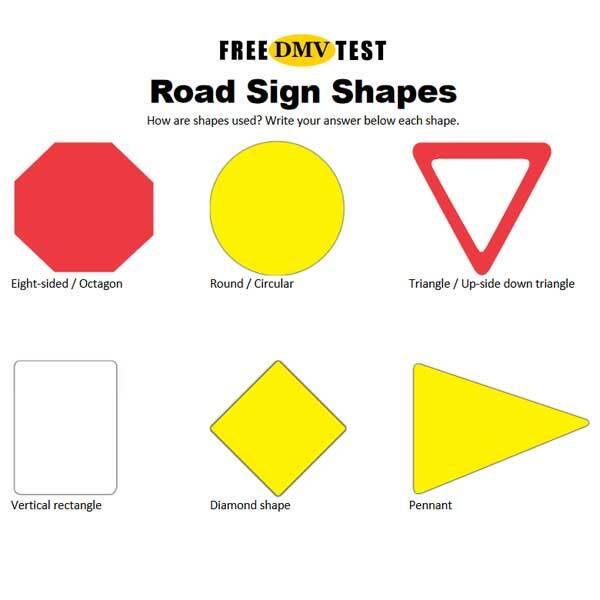 Some illustrations in this article are based on the work of Virginia DMV.